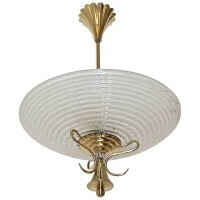 Italian Barovier pendant light with bowl form Murano glass ribbed shade with control bubbles and acid etched back to diffuse light. Glass is suspended on distinctive moderne brass frame and fittings. Fixture uses 2 – 40 watt max candelabra base bulbs, newly wired. Perfect for hall or entry. Brass stem can be shortened to be a semi-flush mount.